Featuring 93 cards. Shop for base sets on eBay. 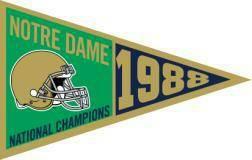 2013 Upper Deck University of Notre Dame Football tackles the storied history of one of college's most beloved teams. Highlighting nearly a century's worth of Fighting Irish gridiron accomplishments, the set includes both modern and old-time legends. Hobby boxes include one autograph and a ton of inserts. The 2013 Upper Deck University of Notre Dame Football base set has a total of 100 cards. The school's greatest players are featured on the first 80. 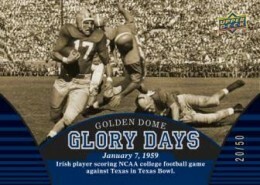 The final 20 cards consist of a Golden Dome Glory Days subset. The deep checklist highlights players and moments dating back to the 1920s. Hobby packs average two or three inserts. Both All-Time Alumni and National Champions have both two and three-player versions. NCAA All-Americans look at the school's decorated players. Finally, there is Irish Icons. The special light F/X cards fall two per hobby box. Autographs fall under several categories paralleling both the base set and nearly all of the inserts. Dual-signed All-Time Alumni and National Champions cards are numbered to 10 copies each. Triple-signed cards are numbered to 3. Among the players signing for the set are Paul Hornung, Joe Theismann, Tim Brown, Ricky Watters, Lou Holtz, Jerome Bettis and Rudy Ruettiger. Retail blaster boxes each come with an exclusive mini pennant card that notes one of Notre Dame's National Championships. 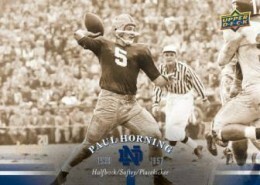 Nice product with lots of football lore to it. One item to add to base set checklist is Card #0 of Raghib Ismail. Mack’s Card Shack � Thanks for the heads-up. Just checked with UD – he’s not an SP, just a last-second addition. Why in the world isn’t Johnny Lujack in this set?